FROM C470 (going west from I25): Exit at Kipling. Turn North and continue North on Kipling. You will pass Ken Caryl, and Coal Mine. Continue to 5944 S Kipling -- we are on the right. If you pass Bowles, you have gone to far. From 285 and 470 (going east on E470): Exit at Bowles. Go East on Bowles past Simms. When you reach Kipling, be sure you are in the right hand lane as you go through the intersection of Kipling and Bowles. We are on the right hand side in the three story brick bank building (Public Service Credit Union). Turn into the entrance to the Parking lot just before ACE hardware. Keep to your right and you will see our building with 5944 clearly labeled on the building. We are on the third floor suite 302. FROM 6th Avenue: Exit at Kipling South. Continue South on Kipling and pass Hampden and Belleville. In approaching Bowles, you will see a Walgreen's on the Northeast corner or Bowles and Kipling. We are on the Southeast corner. You will either turn East (Left) on Bowles and then Right into the shopping center parking lot, OR go straight on Bowles and turn left at the first opportunity to pull into the parking lot. Our office is clearly marked with a 5944 on the building. FROM Sante Fe: Take Sante Fe South to Littleton Blvd/Bowles. 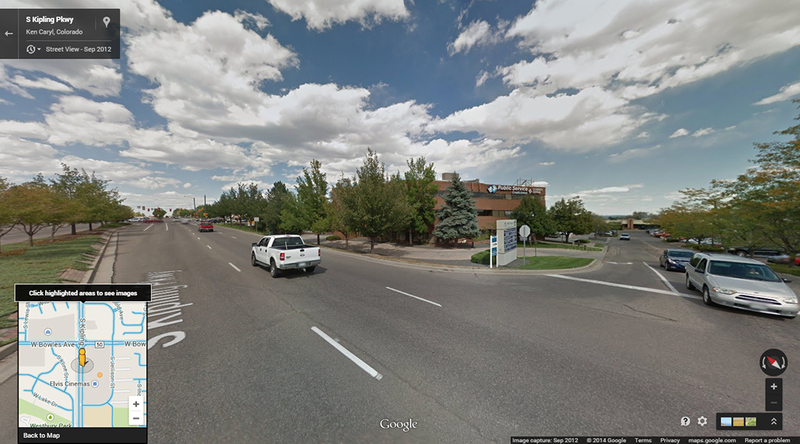 (Bowles turns into Littleton Blvd at that corner) Turn West (Right) on Bowles. Follow Bowles past Wadsworth to Kipling. Turn South (Left) on Kipling and Left again into our parking lot. Our office is on the right which is the Southeast Corner of Kipling and Bowles.